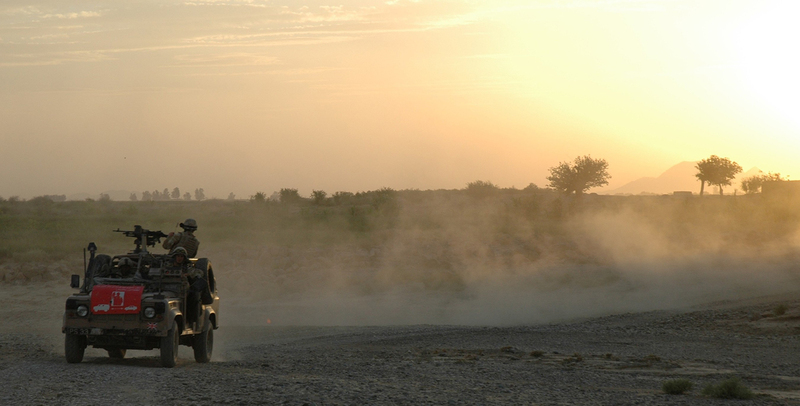 Afghan sunset….an Army Land Rover near Kandahar. This is just one of a series of features and stories Nigel filed from Afghanistan in 2007. His reports and pictures appeared in nine national newspapers, 15 regional newspapers and four magazines. COMING in to land at Kandahar air base, I got my first taste of danger. The RAF Tristar may have resembled the kind of jet you would take to go on your holidays. But there was a difference. This was Afghanistan and the plane was about to land in a war zone, where 70 British soldiers have already been killed. And the Taliban are quite happy to kill you before you land. Recent intelligence reports warned of missiles being fired at planes used by coalition forces. Just 10 days before I arrived, a heat-seeking missile had been fired at a plane taking off from another air base in Afghanistan. Luckily, a sharp-eyed crewman spotted the vapour trail as the rocket left the ground. The pilot fired flares to divert the missile. And, so half an hour before landing at Kandahar, myself and around 200 troops were ordered to put on body armour and helmet. Such protection would be of no use against missiles but the Taliban also fire machine guns at aircraft. With lights blacked out, I breathed a sigh of relief as the plane landed bumpily but safely. I was visiting Afghanistan to meet the Scottish soldiers risking their lives to protect such bases. The RAF Regiment’s 51 Squadron, usually based at Lossiemouth, have been in Kandahar since April. The base, which is home to 12,000 soldiers and civilians, used to come under regular mortar and rocket attack. Flying Officer Matt Jupp, who is in charge of the squadron’s C Flight, said: “When we arrived, we were being attacked around once every week or two weeks. “We have had just one in 75 days.” But achieving such a reduction has been hard and dangerous work. 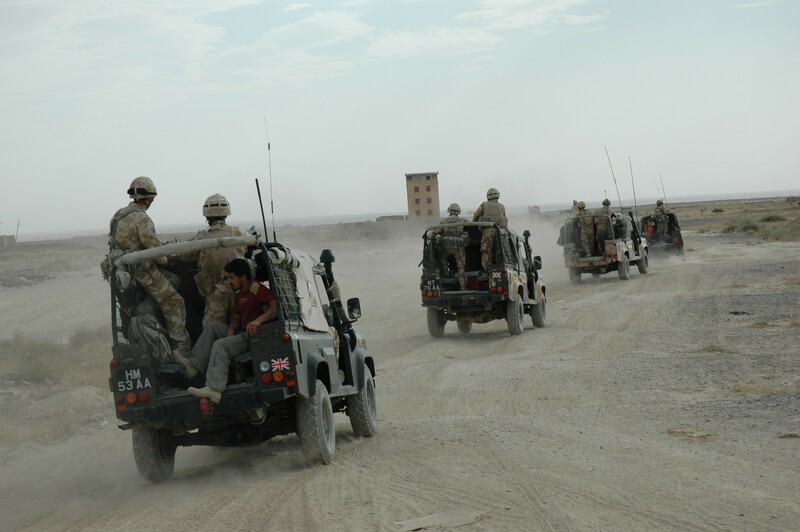 The men have to carry out long, gruelling patrols in open-topped Land Rovers that provide little protection against the threat of suicide car bombers. The Land Rovers carry signs warning local drivers to keep clear of their vehicles. Adverts are also put out on Afghan radio stations. 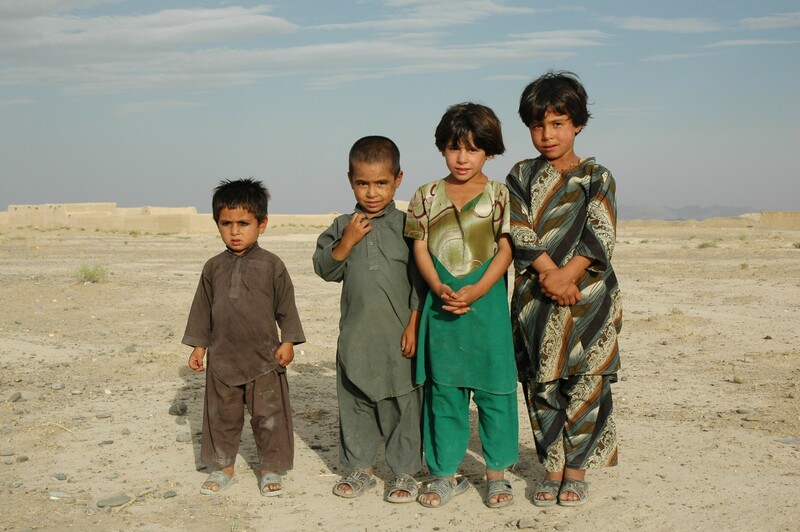 Children in a village near Kandahar. However, many Afghan drivers do not obey the orders, either because their driving is poor or their brakes do not work. Soldiers will often see vehicles speeding erratically towards them. But they are bound by strict rules which prevent them opening fire immediately. Senior Aircraftsman Murray White, 23, from Kirkcudbright, said: “We are trained in how to deal with suicide bombers. “One thing we realised when we got out here was that a lot of the vehicles are old and the brakes don’t work. The drivers can be kids – so long as they can reach the pedals. They might be trying to stop but you just can’t see it. “We signal to them as soon as we see them. If they ignore us, we send a flare up. If that doesn’t work, we fire shots to the side of them. If that doesn’t work, we shoot at the engine block. If that doesn’t work, we shoot the driver.” Fortunately, Murray and his colleagues have so far only had to fire warning shots and hit car engines. I joined the men of C Flight as they loaded their weapons and headed out on a patrol in seven Land Rovers. Just outside the base, we stop to pick up two Afghan interpreters from a police station. These men risk their lives for a wage of £300-a-month. They know the Taliban would cut their heads off if they caught them. But the interpreters are vital to the patrol. On the outskirts of the base, we are hit by the appalling stench of rubbish scattered over several square miles. We also pass old Soviet Army barracks dating back to the Russian invasion more than a quarter of a century earlier. Other buildings are reported to have been used by Al Qaeda to train terrorists. The fact that the Taliban provided a home to Osama Bin Laden was the reason why the Americans and British invaded Afghanistan in 2001. But now, six years later, British soldiers have mixed views as to whether they should be there. Murray said: “You read the papers and there’s a death every week and you think if it’s worth it ?” “I believe we should be here because we’re providing stability for the country but I wonder how much longer it’s going to go on." As well as the dangers, the soldiers face having to work long hours in temperatures of more than 50C (122F). As we head out into the desert, the landscape starts to resemble a scene out of Star Wars, with nomad settlements made of ancient mud buildings. We stop at a village, where we are mobbed by children, shouting and holding out their hands. I assume they want sweets or water but, as Murray points out, the children want pens. “They love writing and drawing,” he said. Sergeant Roy Geddes, 37, from Inverness, said: “I think we should be out here. “As long as the Afghan government needs us, we will be here – and that could be a long time.” Roy seeks out the headman in the village. The visit has two purposes – to win “hearts and minds” and to pick up information on the Taliban. But the Taliban will threaten – and even murder – people they catch “collaborating”. Senior Aircraftsman David Urquhart, 22, from Peterhead, laughs and jokes with the children, allowing them to look through the sights of his rifle. A patrol sets out from Kandahar. But he knows such “hearts and minds” activities can back-fire. He said: “The headmen of the village get night letters from the Taliban. “If they’re seen talking to the coalition forces they’re warned they’ll be killed if they don’t stop.” The patrol moves onto another village, where children rush out to greet us. Roy and his men are offered large chunks or water-melon, grown locally. But water-melons are not the only crops grown in these parts. Just weeks before I arrived in Helmand province, the region had reaped its biggest-ever crop of opium. It is estimated that more than 90 per cent of the heroin on Britain’s streets comes from Afghanistan. Officially, one of the two main roles of the British troops is to cut this deadly trade. Privately, soldiers will tell you they are too busy taking on the Taliban to be able to tackle the drug trade as well. Roy and a small group of colleagues question the headman of the village. Troops are also trained to be sensitive to local customs. They avoid speaking to women and walking into homes uninvited. Even wearing sunglasses while talking to an Afghan can be deemed an insult. Many officers also grow lengthy beards as a sign of respect to the country’s Muslim culture. Shortly after we arrive, gunfire can be heard on the outskirts of the village. The soldiers swap radio messages but otherwise seem not too concerned. Such sounds are common in a country where many civilians carry weapons. As darkness falls, the patrol heads into the hills to visit an Afghan National Police base. The building stands on a hill top on the outskirts of Kandahar. A small group of men dressed in robes and armed with AK47s and rocket-propelled grenades stand guard. But their threatening stance relaxes as the soldiers pull up in their Land Rovers. We are welcomed in and offered cups of sweet tea, along with curried potatoes and naan bread. Roy and his men spend around an hour at the base, chatting and laughing with the police. Afghan custom requires people to spend a long time passing pleasantries before discussing serious business. These men are paid just £10-a-week and are reportedly open to corruption, even allowing Taliban fighters to pass along the valley in exchange for payment. Through the interpreter, Roy is also able to pick up vital intelligence on what has been happening in the area. As we return to base, we can see dark figures in the fields. I am told that some are probably farmers working late to get in their crops. Others I can see are merely wild dogs. However, I know that the threat of an ambush by the Taliban is ever-present.